The toolkits that manufacturers give along with their motorcycles are usually good for nothing substantial. For example, Triumph doesn’t even give a 17 mm Allen key to remove the front axle of a Tiger. So I’m not sure the what XC owners with spoked wheels are supposed to do when they have a flat front tyre. They can’t even remove the front tyre to take it to a puncture repair shop or patch it themselves. Over the years I’ve assembled a toolkit which I take along with my motorcycle luggage on long rides as well as in my small tail bag on short trail rides. I started with a small size Stanley ratchet kit and added stuff to it along the way. 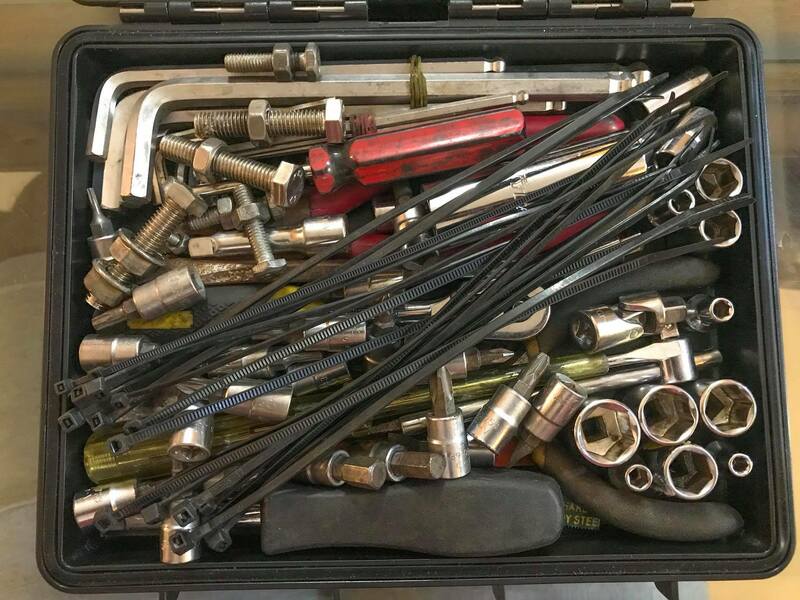 Whenever I work on my motorcycles at home I use this toolkit only. If I find that my toolkit lacks a particular tool, I pick it from the tool chest in my garage and then don’t put it back there. That tool finds a permanent home in my toolkit. BTW, apart from tools, it’s also a good idea to carry along some nuts, bolts and washers of various sizes.